YOUR PET’S BEDDING – KEEP IT CLEAN! 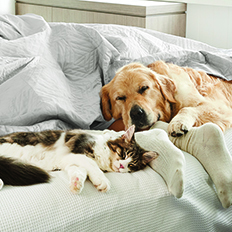 Your pet’s bed can be a haven for dirt and can hide nasty fleas and even ticks. A removable fabric cover on the bed that can be easily washed, helps keep your pet’s sleeping area clean. Regularly vacuuming the bed helps to keep loose hair under control, and don’t forget to clean your dog or cat’s collar or harness. A quick way to clean them is in a bowl of hot water and dog shampoo. Give it a final rinse with cold water, leave to dry and it’s good to go.